Can it really be 2019 already? We at Operation Black Hills Cabin have been busy getting applications approved by the Selection Committee, calling references, and scheduling weeks! We are doing this in the middle of 2 feet of snow (and more coming!) currently at the cabin. We certainly hope that you have gotten your supporting documentation sent to us and are among the applications we are scheduling for weeks May through September in 2019. This one-week respite is LIFE CHANGING and we don't want you to miss out! Ok, so our 2018 season has come to an end. We hosted 18 families this summer. That was 18 opportunities to help with the healing process and help these families reconnect. We could not do this alone. Please join us on October 6, 2018 from 4-6 pm for our THANK YOU to all business sponsors, volunteers and supporters of Operation Black Hills Cabin. There will be lots of food, fun and gratitude. Please come! While we shovel snow, avoid ice on the sidewalks and roads, and brace ourselves for the winds, all elements of a normal "South Dakota winter", the 2018 season is fast approaching! * ongoing "spread the word opportunities". * designing a new rack card. * possible additions to "The Healing Hike". * bringing a new board member up to date. We will be finalizing weeks for the 2018 families soon, so get your applications and supporting documentation sent in as soon as possible! Each week is scheduled on a first-approved basis. Please join us for this informative educational session and "Thank You" on November 12, 2016 at the Air and Space Museum at Ellsworth Air Force Base. Operation Black Hills Cabin is partnering with the Air and Space Museum and the Black Hills Veterans Writers Group to provide a special focus on Iraq/Afghanistan veterans and the circumstances they encounter upon their return. This Tribute will consist of four returning veteran speakers who will relate their experiences in their attempt to reintegrate into family and society. Erin Dreis, Travis Bolt, Bob Liebman and Brandon Stackenwalt will provide insight into their lives and what we can do to help them and the 52,000 other wounded in action returnees from the recent conflicts in Iraq and Afghanistan. Refreshments will begin at 9:00 am with the program to begin at 9:30. EVERYONE is invited to attend, veteran and non-veteran. Hope to see you there! OBHC is hosting an Appreciation Night at the cabin on October 13, 2016, 5:30-7:30 pm. If you are a volunteer or a sponsoring business, attraction or service, please join us in a recap of the season and a get-to-know each other evening. Come celebrate the philanthropic efforts alive and well in Custer, South Dakota! Food and fun provided! The UPPER DECK of Buglin' Bull Restaurant and Sports Bar in Custer, SD, is having a party on Saturday, the 4th of July! Come for FOOD, FUN & FIREWORKS starting at 9 pm! 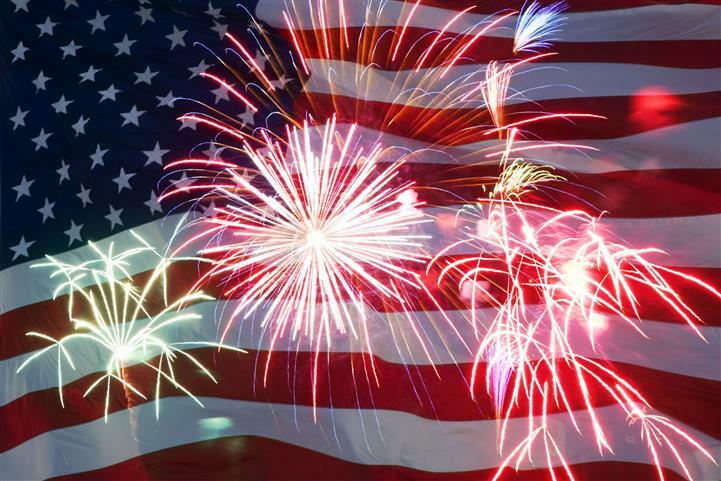 They are serving Appetizers, Drinks and USA Birthday cake starting at 9 pm. Come for the BEST SEAT IN CUSTER to watch the fireworks for $50 per person. South Dakota Community Foundation has put together a video highlighting Operation Black Hills Cabin as well as several other individuals who embrace philanthropy in our State. They have interviewed one of our past veteran families and have toured our cabin and the "Healing Hike". Click HERE to watch this informative video. made a presentation at their Regional Meetings in March of 2015. Thank You, DAR! Mary Jo Marcy, a local Hill City resident artist, has graciously donated her bronze sculpture, "Spirit of Healing", to Operation Black Hills Cabin. It has been laid into a six foot tall rock monument as pictured and enhances the entrance to our Healing Hike. 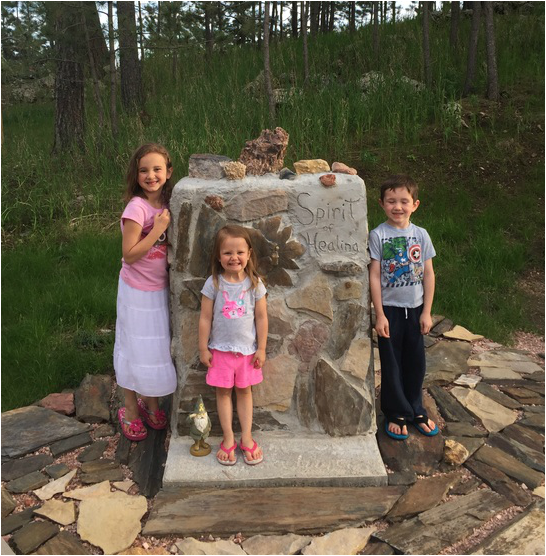 Mary Jo and her husband, Bill Birkholt, finished construction of the stone monument this spring We are so excited to have this wonderful addition to our Healing Hike. We hope that the "Spirit of Healing" will touch all of our families in their daily struggles. MANY THANKS TO MARY JO and BILL!